Excellent Service - we stand by our products and they've been extensively researched, designed and tested by triathletes with years of experience. In the rare event that you run into any issues at all with your Suit, we will be on hand to help get them resolved. COMFORT: The elastic waistband and the drawstring keep the shorts in place. No matter if you are pushing yourself from the wall or doing a run - these shorts stay in place and they don't bunch at the waist. The Softleg finish (NO SILICONE LEG GRIPPER [PLEASE NOTE: If you have smaller/thinner legs, these shorts might not be the best fit for you]) allows for a comfortable fit around your legs without squeezing them. PERFECT PADDING FOR CYCLING & RUNNING: Our foam-cushioned pad provides chafe-free support throughout your entire bike ride. Plus, it's so light & slim it won't slow you down on the run. ULTIMATE MUSCLE COVERAGE: 7 inseam (for size L, length graded for other sizes) - reduce muscle vibration, a major cause of muscle fatigue. Push harder and longer in these Triathlon Shorts. SUPERIOR FABRICS: Our flexible fabric blend stretches in ALL directions which makes it incredibly comfortable - you won`t even feel you are wearing them. Fits like a second skin - no chafing or soreness anymore! POCKETS: Thanks to our 2 side pockets - located at the hips, your nourishment is always handy. Reach from either side to grab your energy gels, bars & chews or even your phone. Plus they aren`t in the way or bother you during the swim. PLEASE SEE SIZE INFORMATION IN THE PICTURES. Sundried is a premium ethical activewear brand with products designed by athletes for athletes. We use the latest technology in our designs so that our sports apparel keeps up with you no matter what the workout. Our speciality is triathlon. We've got you covered whether it's your first ever race or you're a seasoned competitor. Our technical kit has everything you expect from a superior triathlon suit and is trialled and tested by world-class athletes all over the globe. Sundried's premium triathlon suit is designed to provide exceptional performance for all levels of triathlete. Specifically designed for swimming, cycling, and running, the suit fits like a second skin to keep you dynamic and to prevent chafing throughout the race. Our fabric is fast-drying and chlorine-resistant with subtle padding providing comfort and shock absorption on your ride without causing irritation on the run. The Sundried tri-suit is designed with a second-skin fit to give full range of movement and allow you to perform at your best without being restricted. The sleeveless design allows for total freedom of movement on the swim so you can get on with racing without worrying about your kit holding you back. Our technical materials are super fast-drying to prevent chafing after the swim with a long-length zipper to the back for comfortable breathing and easy removal. The triathlon suit features a subtle hypoallergenic pad to provide comfort on the ride but you won't even notice it on the run so that you can get on with your race. Intelligently designed leg grippers mean the legs won't ride up while you run and prevent irritation throughout the entire race. MSRP $120. The Sundried tri-suit is designed with a second-skin fit to give full range of movement and allow you to perform at your best without being restricted. The sleeveless design allows for total freedom of movement on the swim so you can get on with racing without worrying about your kit holding you back. Featured in 220 Triathlon and used by professional triathletes. Our technical materials are super fast-drying to prevent chafing after the swim with a long-length zipper to the back for comfortable breathing and easy removal. Sundried cares about its customers as much as its racing gear. We guarantee total satisfaction, but if you experience any sort of problem whatsoever with your order, we will be in contact the whole way to find a speedy solution. 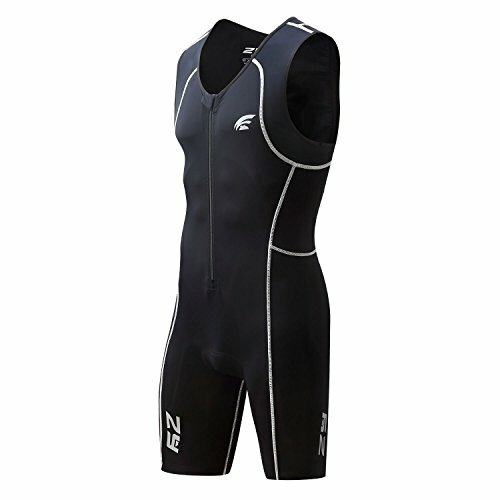 The X Suit was designed for triathletes who looking for great quality suit with more stylish look. This suit encourages participation in multi sport and give entrants to the market a high quality product but at an affordable price. 2 Rear pocket & 2 side pockets Storage for all race essentials. These Triathlon suits made from High end 80% Polyamide / 20% Elastane Italian technical fabric wicks moisture away & dries very quickly. Keeps you cool & comfortable. Technical Compression fabric reduce muscle vibration, a major cause of muscle fatigue. High Visibility: Reflective logos. High End Italian Fabric has 4 way stretch directions which makes it incredibly comfortable fit like a second skin - no chafing or soreness. Offers excellent UV protection UPF 50+ High Chlorine resistance. Gel thigh grippers. 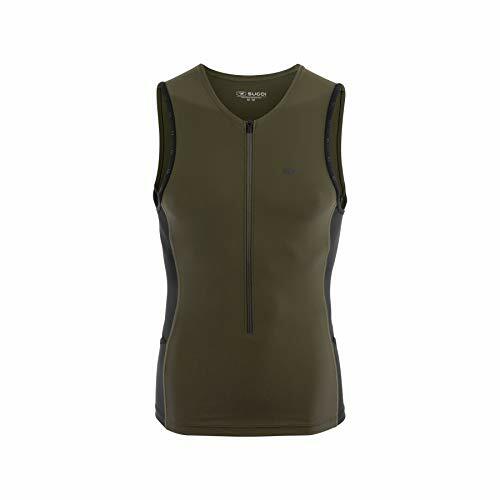 14 front zipper & Soft flexible mesh keeps your body cool & allows great ventilation. 6mm quick drying pad, 2 rear pockets, 1 thigh pocket on each leg. This new redesigned Triathlon Shorts for men delivers comfort, durability and a great fit. The new race cut and fit makes them even better: a longer inseam makes this quality tri shorts even more popular! 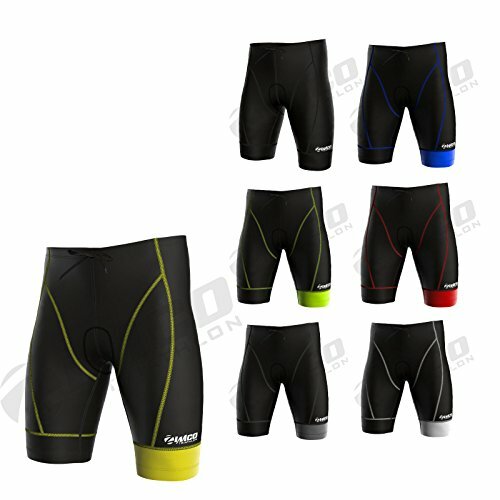 This is a great shorts from Sprint Triathlon all the way to Ironman and they match our triathlon tops. The exceptionally breathable and lightweight custom materials provide maximum thermoregulatory and compressive effectiveness. Flatlock, clean finished seams offer ultimate comfort and durability. No chafing on race day! Special thin Triathlon pad with air channels for maximum comfort - you won`t even feel it is there. It offers enough support on the bike but does not hinder you on the run. The two hip pockets hold all your essentials close to your body without them bouncing around. The softleg finish allows for maximum comfort on your legs without the disturbing silicone leg gripper. ATTENTION: PLEASE SEE SIZE CHART (PICTURE ON THE LEFT) FOR A PERFECT FIT. 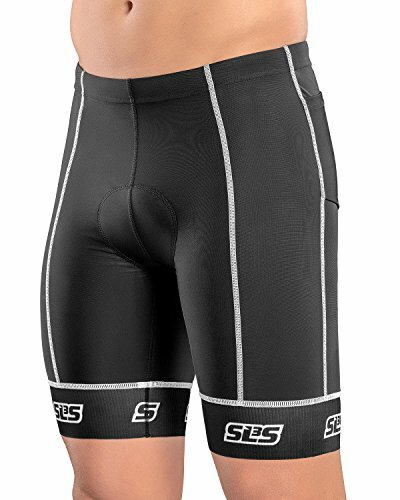 ULTIMATE MUSCLE COVERAGE: longer inseam ( 8 for size L) - reduce your muscle vibration with these triathlete shorts, a major cause of muscle fatigue. Push harder and longer in these Triathlon Shorts. 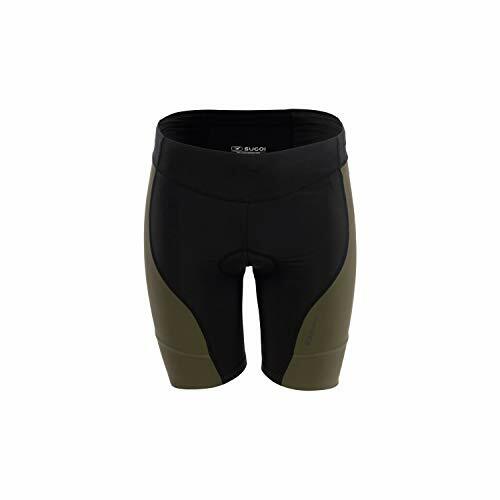 PERFECT PADDING FOR CYCLING & RUNNING: These mens triathlon shorts come with a foam-cushioned pad that provides you a chafe-free support throughout your entire bike ride. Plus, it's so light & slim it won't slow you down on the run. POCKETS: Thanks to our 2 side pockets on these tri shorts - located at the hips, your nourishment is always handy. Reach from either side to grab your energy gels, bars & chews or even an iPhone. Plus they aren`t in the way or bother you during the swim. The select pursuit Tri singlet features select transfer dry fabric and delivers value, fit and durability for all levels of triathletes. Perfect for any distance of race and built to be fast throughout. 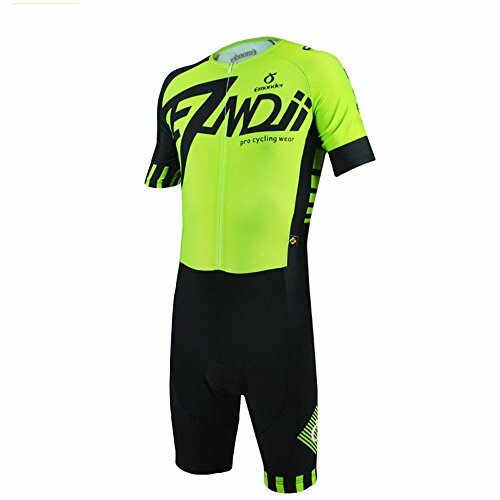 Have you been looking for a good-quality triathlon one-piece on nice price? Are you a triathlete novice, who does not know which triathlon one-piece should buy? Our tri suit takes the foam pad to let your bottom dry quickly and feel free. And the quick-dry fabric we use will wick away the water and your sweat effectively. These will result in an improved performance and added comfort during a long-time triathlon. Our triathlon suit uses the foam pad to lower the weight during swimming and to support your sit bones without chafing in cycling. 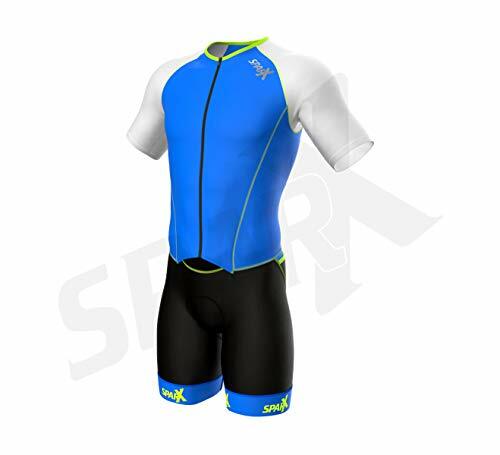 The skinsuit especially takes the sleeveless design, for reducing the chafing a lot during the running, swimming and cycling. Our men one-piece suit is made of flexible fabric stretches in 4 directions. With an extended zipper, the trisuit is easy wearing while still giving plenty of flexibility. And it comes with a 90-day warranty. There are 5 sizes (S/M/L/XL/XXL) for the following listing. Please allow 1-2cm differs by manual measurement, thank you! Pockets - 2 elastic pockets on the back for storage will let you get energy food easily and move naturally. Silicone leg grippers provides a tight fit for your leg. Our triathlon suit is unique in style, and the short sleeve design is more effective than sleeveless to reduce muscle friction and damage. 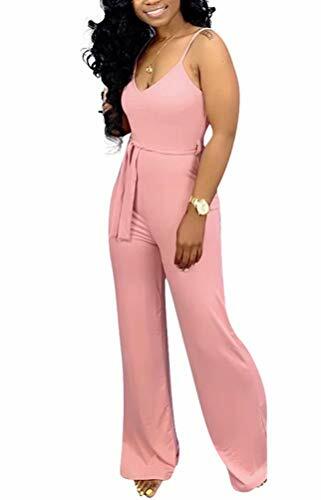 Longer half zipper for easy to put on and take off. This triathlon suit breathable and quick-drying. The design of micro-pressure will not bring a tight feeling. On the contrary, it can perfectly show your good figure. It is the best choice for you to participate in competitions or sports. 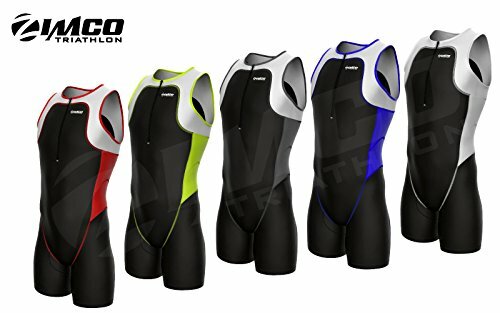 ATTENTION: Please see the size chart on the left (pictures) for a perfect fit - these tri suits run differently than other brands! The suit will NOT fit if you are maxing out the height and weight (in this case we recommend to size up)! PERFECT PADDING FOR CYCLING & RUNNING: Our custom foam-cushioned pad on this tri suit for women provides chafe-free support throughout your entire bike ride. Plus, it's so light & slim you won`t even notice it is there and it won`t give you the feeling like running in a wet diaper. Thanks to our back pocket (3.5x4.5), your nourishment is always handy. Reach easily to grab your energy gels, bars & chews. 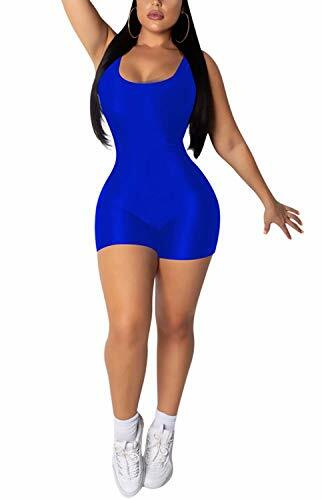 DESIGNED TO KEEP YOU COMFY + CUTE: You will LOVE the color, style and coverage of this flattering women`s triathlon swimsuit. Our flexible fabric blend stretches in ALL directions for a sleek and supportive fit and it comes without itchy seams. The legs are long enough to prevent chaffing on the run plus the soft gripper keeps the legs in place without the feeling of having sausage legs. We are NOT using a built in bra so you can wear the bra of your choice - BYOB (Bring your own Bra). ULTIMATE COOL: Made of a super-comfortable nylon/spandex mix, your SLS3 Women Triathlon Suit wicks sweat, then evaporates it FAST, to keep you cool & dry. We added mesh panels on the side and back to keep you even more comfortable. FRONT ZIP FOR CUSTOMIZED COMFORT: Race heating up? Breathe easy. Just open the front half-zipper (11 long for size M) to let in cooling airflow. Chill in the air? Pull the zip back up & lock it down in its zipper garage. The zipper is also long enough (10.5) to easily get into and out of the trisuit. Feel like one of the pros in the Sparx Men's Elite SS Tri Suit. Designed to improve your performance on the bike, this tri suit is carefully engineered and aerodynamics to give you the maximum speed and comfort throughout the race. Speed fabric on the short provides unbeatable stretch-ability that moves with you with minimal water absorption to prevent heaviness from the water. If you want a suit that'll perform just as well as you do, then this suit is the perfect choice for you! These Triathlon suits made from High end 80% Polyamide / 20% Elastane Italian technical fabric which dries very quickly , keeps you comfortable. Offers excellent UV protection UPF 50+ High Chlorine resistance. Gel thigh grippers keep the short in place. Performance LYCRA Fabric helps you stay dry and comfortable. HI FIL MESH for temperature and moisture management utilizing high filament technology. TRAIN LIKE YOU RACE WITH THE SIM PRO II SHORTS The SIM is the first practical triathlon and swim training tool to mimic the body position and experience of a wetsuit swim by lifting you up - without overheating from wearing a wetsuit in an 80 pool. This patented suit is a game changer. It's better than a pull-buoy, because it lets you kick and turn naturally. It also gives just a touch of warmth for those cold morning workouts. The SIM makes every swim a race-specific training workout. Once you try it, you won't ever want to go back. 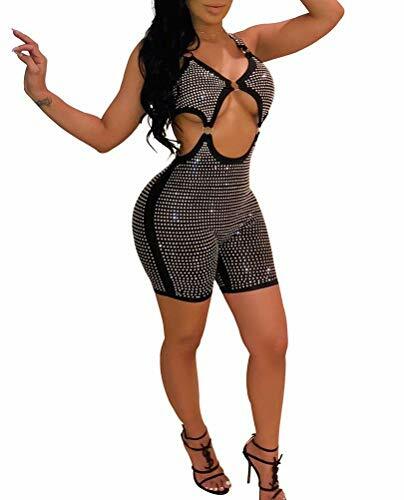 Note, these shorts are designed for the pool and should have excellent durability if you rinse them after use with fresh water and dry them thoroughly. GET THE FASTEST BODY POSITION The SIM Pro II lifts up your hips just like a wetsuit, putting you in the fastest position possible and helping your body develop the muscle memory needed on race day. Most top wetsuit manufacturers focus on buoyancy alone. Sure, wetsuits help lift you up, but that's not enough - and in some cases it can really get in the way of fast swimming. If you want to swim faster with less effort, then rotation matters a LOT. A fast freestyle requires effective rotation along your centerline to generate power and speed in the most propulsive phase of your stroke. The Maverick Pro leverages basic laws of physics. We call our application of those laws "RS2" - the ROKA Speed Stripe. We also use Yamamoto's SCS coating to further reduce form drag. We're confident you'll feel the ROKA difference as soon as you jump in the water. 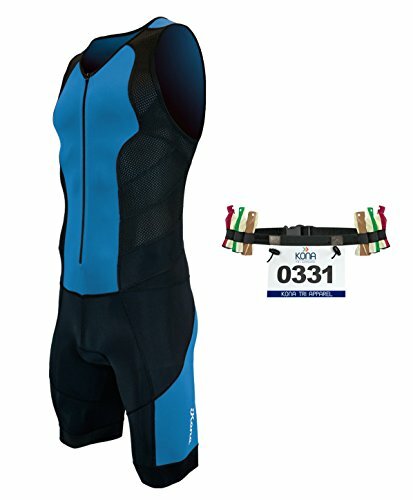 The SIM is considered by USAT rules to be the same as a wetsuit. Therefore, you may wear the SIM in a race where wetsuits are permitted, but you may not wear it in a non-wetsuit race. Feature filled and value packed. This flattering tri short delivers on performance, taking you from high-octane training to race day. 7.5" inseam.